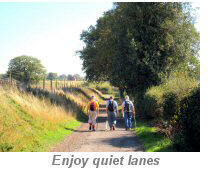 Enjoy this walk on the MILLENNIUM WAY. 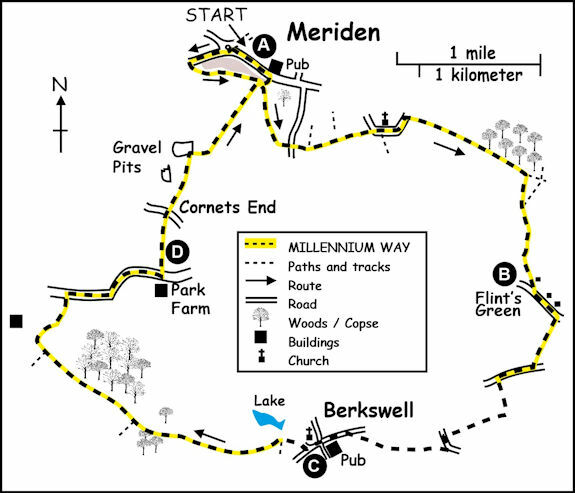 Apart from a one mile section from Benton Green and through the village of Berkswell to the lake at Berkswell Hall, the route is entirely on the MILLENNIUM WAY. The way is clearly waymarked with the distinctive black Millennium Way circular waymarkers. Find out more about the walk by clicking on the information icon. 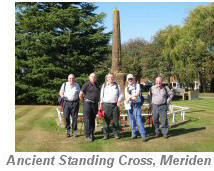 Our walk starts from the mediaeval stone cross situated on the village green in Meriden and which reputedly marks the centre of England. Meriden is also the mid point of the 100 mile long distance walking path known as The Millennium Way, a delightful walk which runs from Pershore to Meriden then down to Middleton Cheney. Our circular walk incorporates the two northern sections of the Millennium Way, joined by a short link through the delightful village of Berkswell - enjoy. From the mediaeval stone cross walk down the road with shops on your left, pass the Cyclists Memorial (commemorating all the cyclists who gave their lives in the First & Second World Wars ) and at the Bulls Head pub cross the road, and take the driveway opposite into Meriden Hall. At the end of the metal railings take a signed passageway right, then at the end of the passageway take a large kissing gate and go left with hedge left to take a wooden kissing gate. Go ahead with wall and interesting building to your left. At the end of wall go ¼ right up the hill to find a mid fence metal gate. Take the gate and go half left across the field corner to take a mid fence stile. Go ahead over the stile to wire fence, and ahead with fence on your right to come to stile leading to road. Cross road with care and take kissing gate into field. Go 1/2 left to cross field and find corner kissing gate. Take gate and go right with hedge right to exit field by kissing gate. Go ahead keeping the hedge on your right. Halfway along field look for wide gap in the hedge on your right, take the gap and then go left keeping the hedge to your left towards the copse and overhead power lines. Here you will have the first view of St Laurence Church. Continue on with copse to left to find a waymarked grassy exit track on left. Take the track and exit to road via gap next to large metal gate. Go right on road, passing St Laurence Church. Continue on, going past the public footpath sign, for a further 75 yards passing Moat House Farm to find Fentham House on right at road corner. Take the short grassy vehicle track to left Fentham of house to find narrow gap by a gate. Go through gap to take permissive path, and go 1/2 right across field to exit by far right corner gate. Go ahead on track keeping hedge on left and wire fence on right. Continue ahead on a track with hedge left to find kissing gate on left. Go through kissing gate and follow direction of waymark to cross corner of field to reach edge of Millison's Wood ahead. On reaching edge of wood go right keeping wood on your left. Halfway along wood you will come to a solitary way post pointing to a narrow path right across field. Go along this narrow path across field to pass to left of lone oak to corner of wood. (This apparent doubling back is to ensure public rights of way are followed). Go ahead for 50m with wood right to find kissing gate at corner Take kissing gate then over bridge into field. Go right for 25 paces then turn left up field centre to skyline hedge gap. Through gap and continue ahead with hedge on your left. Follow track around corner then past barn on right, and take kissing gate to road. Go left on road passing Shirley Lane and entrance to a farm shop, continue under power lines and take kissing gate right opposite Oak Farm. Follow direction of waymarker across field to top far corner kissing gate. Go through kissing gate and continue down field to far left corner gate. Through gate and continue ahead along short track to take kissing gate to road. Go right and after some 250 paces pass two cottages on left. Face last cottage, the footpath is across the front garden, keeping hedge right, continue pass cottage left and hedge right then up back garden to exit by fence gap to find hidden passage. Take passage to reach kissing gate and continue along grassy track with hedge right and far pylons right to reach far corner kissing gate. Take kissing gate and go left with hedge left to take field corner kissing gate. Go right to hedge gap, continuing ahead under overhead cables to the next hedge gap by metal way post. Go through gap and continue ahead with hedge left to field corner stile, through collecting paddock and over stile to the road. Here we turn left on the road and after some 40 paces take driveway right. Just before Sunnyview Cottage take the hidden waymarked passage left then over step stile into field and go right for 40 paces to find gate. ( At this point we leave The Millennium Way for a little while. ) With your back to the gate go diagonally 1/2 right towards trees and a kissing gate. Take kissing gate and continue directly ahead across field towards gap in far hedge. Take kissing gate and continue directly ahead, to walk past a clump of three trees in the middle of the field. Continue on same heading to find a kissing gate in the field corner, just to the right of the houses which you will see ahead. Take kissing gate then go through a short passageway to the road. Turn left towards the crossroads where you will find the Bear Inn, a delightful old pub in the village of Berkswell ,which dates back to the 16th century and was used by Cromwells troops in the civil war. Go directly over the crossroads into Lavender Hall Lane, then after a few yards turn diagonally right up Church Lane towards the attractive 12th century Norman church of St. John Baptist. The village of Berkswell takes its name from Bercul, a Saxon landowner and the 16 ft square stone-walled well near the church is said to have been used for baptisms by immersion. Continue ahead through the churchyard to a gate, then through a small wood and on to a long section of boarded walkway through a field, with views of Berkswell Hall ( built c.1815 ) to your right. ( Take extra care on the boardwalk as there are some damaged sections awaiting repair.) Cross the bridge over a stream, continue to a kissing gate and turn immediately right, to rejoin the waymarked The Millennium Way. Pass through a small wood and follow the well defined path through the field heading for the corner kissing gate at edge of wood. 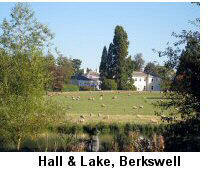 You have lovely views of the lake & hall to your right. Go through a kissing gate at the corner of the field into a small wood, then continue around field keeping the hedge to your right, the path eventually passing a wood on your right to arrive at a wooden kissing gate. Take the kissing gate and turn right to follow edge of field with hedge to your right for 200 paces to find another wooden kissing gate. Turn right through kissing gate into wood. Turn left along edge of wood keeping to right of pond. 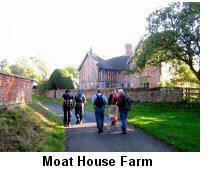 Continue ahead along attractive woodland path and over wooden stile keeping hedge to left . As path approaches farm turn right at gatepost and go with high broken hedge on left. Head gently downhill and go through kissing gate in corner of field, then ahead to cross bridge over stream and through metal gate. Head across field towards stile. Go over stile, bear left along path at edge of quarry works on right. Take gap next to large metal gate to go right along surfaced track eventually passing through a wooden gate next to a large metal gate. Stay ahead on track to reach a metal gate - in - gate on left just before entrance to Park Farm. Go through this gate and take fenced footpath with quarry workings to your left. Stay on path with fence to your left until you reach the road. Turn right onto road and after 50 paces ( just before entrance to Cornets End Farm ) turn left through concealed kissing gate along path with quarry workings on left. Continue over footbridge, the path turning right. Follow path around with quarry workings left, shortly to join a rising fenced path. Continue up rising path between fences and keep a sharp lookout for large metal kissing gate on right ( partly obscured by a small tree.) Go through kissing gate and go diagonally half left across field ( following the direction of the black Millennium Way waymark ) then downhill to metal gate. Cross corner of field to metal gate and wooden bridge. Go diagonally left up field to furthest corner then through large metal kissing gate on to surfaced track. Cross track to follow waymarker and continue on footpath for a little over 100 yards to reach a waymarked gap right adjacent to a stile. Go down enclosed footpath to find road. Go right on road to roundabout then turn right and you have arrived back in Meriden. The village claims to be the very centre of England and a sandstone pillar-shaped monument to that effect stands in the village green. This medieval village cross is a grade II listed artefact. A second memorial to all cyclists who died in the World Wars can also be seen. Meriden was home to the Triumph motorcycles plant from 1941 to 1983. A plaque commemorating the site stands outside Bonneville Close. The parish church is dedicated to St. Laurence and was apparently founded by Lady Godiva. It has a Norman chancel with a squint, gargoyles on its roof and a golden weathercock. 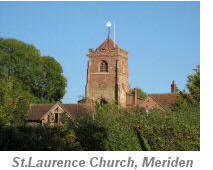 In fields south-west of the church is St. Laurence’s well where tradition says he baptised his converts. The well in later times was believed to have healing properties, especially for sore eyes and sore legs. A beautiful timber-framed farmhouse with interesting chimney-stacks. It bears the date 1610 but may be 16th-century; listed Grade II. Around the house and farm-buildings is a moat, mostly dry. An interesting village with a lot of history. 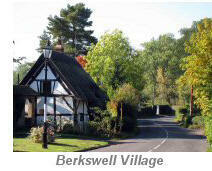 For detailed notes on the features and history of the village, see the ‘points of interest’ notes for Walk East from Berkswell. 19th century country house, now converted into residential apartments. Grade II* listed. A manor house has existed since 1556 but the present house dates from 1815. Between 1815 and 1860 it was a school, but restored as a house and sold to Joshua Wheatley in 1888. In 1984 the estate was sold for redevelopment but the surrounding land is still owned by the Wheatley family. The extensive gravel pits at Cornet’s End, from which lacustrine sands and fluvioglacial gravels have been extracted for many years are now being landscaped and converted into sites for industrial development. However, extraction continues in adjacent pits.